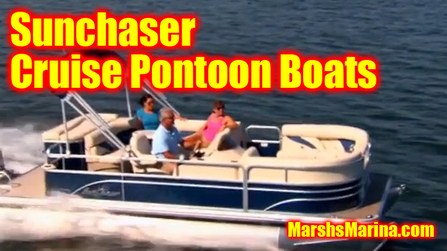 Sunchaser's Cruise pontoon boat series combines style, comfort and convenience to give you great experiences on the water with family and friends. And with more models and package options, you can be sure there’s a Sunchaser that's right for you. You will wish the ride would never end. Finally, a pontoon that sports the features of high end models but without the high end price. Rounded bows, custom molded dashes, comfortable L-group seating, anodized rails and plush 22-ounce carpet are just the beginning of a long list of features found in the cruise series; and, of course, SunChaser cruise pontoon models are so much fun to drive you'll wish the ride would never end. 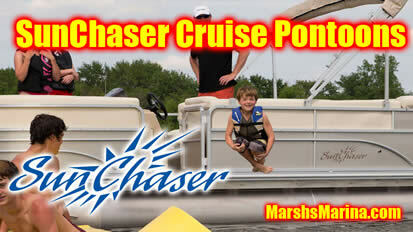 Click Here for our In-stock Sunchaser Pontoon Boats!